B.C. 's chief medical officer Perry Kendall speaks during a press conference in Victoria on January 18, 2017. Canadian health-care experts, including British Columbia's provincial health officer, want the federal government to strongly consider Portugal's approach to drug policy, including the decriminalization of personal possession. 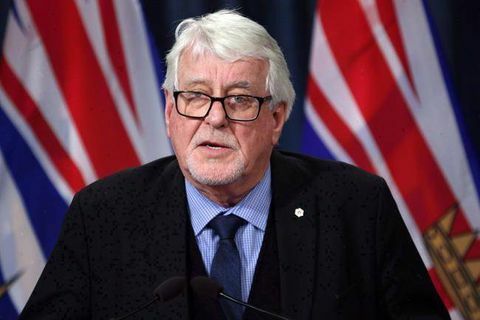 Portugal's model could benefit British Columbia, Perry Kendall said, noting his province has seen increased overdose deaths from illicitly produced fentanyl – a problem moving across Canada. Portugal did not decriminalize all drugs in all circumstances, he said, noting the country's approach removes the application of criminal law on personal possession for limited amounts while offering education and social supports. "A lot of my colleagues have made recommendations that we should really look more closely at Portugal … to see if there might be a better, more productive way of addressing public safety issues and particularly … destigmatizing drug use," Dr. Kendall said in an interview with The Canadian Press. "I think it is incumbent upon us, if we are really serious about trying to deal with this epidemic which is actually killing people, then we need to look at these alternative, regulatory frameworks to see if they might work for us." He said it would be up to Ottawa to shift its approach, because the Controlled Drugs and Substances Act is a federal law. He pointed out that much time and resources are currently spent chasing people around the court system but this doesn't curb the drug supply, nor does it stop people from dying. Last week, B.C. 's chief coroner, Lisa Lapointe, reported 780 overdose fatalities between January and June – up from 414 during the same period last year. Fentanyl was detected in nearly 80 per cent of deaths between January and May. The federal government is also showing interest in Portugal's policy. Late last month, Health Minister Jane Philpott and Justice Minister Jody Wilson-Raybould travelled to the country along with Canada's chief public health officer, Theresa Tam, to learn more about the Portuguese approach to drugs. Portugal can teach Canada a "great deal" about how taking a public health approach to drug policy helps the justice system work better, Ms. Wilson-Raybould said in a statement. "What I saw and heard from our Portuguese hosts during our time here will provide valuable input as we continue our government's review of Canada's criminal-justice system," she said. The ministers also attended a presentation on data collection by the European Monitoring Centre for Drugs and Drug Addiction, said Dr. Philpott's press secretary, Andrew MacKendrick. He said they also heard about Portugal's use of a commission designed to divert people with substance-abuse issues away from the judicial system. NDP justice critic Alistair MacGregor, a B.C. MP, said he was pleased to see the ministers head to Portugal and he hopes Parliament will discuss whether Portugal's model could be a good fit for Canada. The country has been able to drastically improve its situation since it decriminalized personal possession of drugs in 2001, he added, noting the approach allowed people to "come out of the shadows" and seek help. "Obviously, something is working in Portugal," he said. "I think if we are serious about tackling this opioid crisis, which is ravaging my province currently, we need new approaches, because to continue the same old model has been an obvious failure by any measure." Donald MacPherson, executive director of the Canadian Drug Policy Coalition, agrees all parties in the House of Commons need to consider a range of options, including Portugal's approach, to address the depth of the opioid crisis. "It is a real disaster," he said. "They are fully justified in trying new, innovative programs." To that end, the government should consider the creation of drug supply outside the black market, Mr. MacPherson added, noting the illicit supply of fentanyl is creeping across the country. "In immediate term, that is the only way we are going to have a significant impact on the overdose rates," he said. "It is a no-brainer that we could be providing safer opioids for people who are addicted, severely addicted in many cases and not forcing them to use what we know is a deadly, illegal market." First Nations people three times more likely to die of overdoses in B.C.